A strong sign that the nation-state is in decay is the frequency we see announcements of companies that are replicating some of the most sensitive government services. The most recent mover is Walmart, which is in the process of putting together its own intelligence arm (it's being built by a former CIA/FBI officer Kenneth Senser). For those unable to afford their own global intelligence unit, Blackwater's Cofer Black is building one called Total Intelligence Solutions. If you want to get up to speed quickly, the background for this is available in BNW. One of the groups most likely to play a hand in driving the price of gasoline to $5 a gallon (or much more) and hollow out a major oil producing state isn't Islamic or in the Middle East. It's located in Nigeria and goes under the name of MEND (Movement for the Emancipation of the Niger Delta -- more about MEND). Its success so far includes the ongoing disruption of 1/4 of Nigeria's oil output (of light sweet crude destined for the US) and a radical slowdown corporate activity (due to attacks that put pressure on corporate psychology, particularly Shell). A thin leadership structure composed of recognized leaders across the delta that can funnel arms, cash, and training to the ad hoc groups it assembles. This effort has significantly improved the quality of the guerrilla operations in the Niger delta. This leadership organization also carefully manages the publicity surrounding its actions to build brand awareness. A large pool of individuals and bands of individuals that have ties to multiple primary loyalties (from ethnic militias to gangs to cults) that are hired to carry out MEND's operations. "For example, 'Mike' from Gbaramatu can fight for MEND one day, rig an election for his local government chief the next, kidnap a foreigner for ransom and get in a cult clash on Saturday." Ongoing support for smaller, criminal gangs that take hostages and conduct operations primarily for criminal gain. The reason: it aids in making Niger delta ungovernable. Resistance to Ethiopian troops and the Ethiopian-installed Transitional Federal Government (TFG) is inspired by nationalism, religion, economic factors and clan loyalties, yet all of these motivations are part of a constantly shifting pattern of allegiances in which the only common characteristic is a desire to expel foreign troops from Somalia. Omar Hussein Ahmed, a Somali trader, as an explanation for why fellow traders had bought missiles to shoot at government soldiers. To the New York Times. For more insight into how corruption, guerrilla warfare, and black globalization form a feedback driven system that destabilizes states, read my book review of Moises Naim's Illicit. I also have a large section in my book that explains how this works (in detail and with numerous examples so you can easily get your head around the idea). The ONLF has stated on numerous occasions that we will not allow the mineral resources of our people to be exploited by this regime or any firm. An ONLF spokesman to Reuters. On April 24, a China Petroleum and Chemical Corp. oil field in eastern Ethiopia (near the Somali border), was attacked by gunmen (presumably by the Ogaden National Liberation Front, the ONLF, an ethnic Somali group that has fought alongside rebels in Somalia). 74 people were killed, including 9 Chinese oil workers. 7 Chinese workers were kidnapped by the assailants as they withdrew under pressure from responding Ethiopian troops. This attack is yet another example of how guerrilla groups are using attacks on companies (to influence corporate psychology) to fight the states that rely upon them for funding (although a close read of this incident suggests that it was the group stumbled upon the right strategy for the wrong reasons). We can expect to see more of this in the future. In addition to the implications for warfare, this may presage the beginning of the end of the easy road for China's aggressive oil acquistions in Africa. Over the last decade, China has increasingly fed its enormous appetite for oil (upwards of 40% of the growth in demand for oil is from China), through deals with African regimes that have significant problems (from genocide to guerrilla wars to rampant corruption). I also suspect that this will significantly shorten the time it takes to see Chinese PMCs (private military companies) in Africa. I will be on Christopher Lydon's nationally syndicated show Open Source tonight (24 April) for an hour to discuss my book Brave New War. Here's a recap of the show tonight. Special guests include Richard Clarke and Moises Naim (by the way, Moises' book Illicit is excellent). Note: I was subpar, but the other guests and the host were amazing. Thanks so much for Dave and Christopher for making this happen. I still have a steep learning curve to go through before I get good at this. One reason that it seems that the US military and the Iraqi government is besieged on all fronts simultaneously is due to the use of swarming maneuvers (see the brief: "Global Guerrilla Swarming" for a more detailed analysis of the topic). 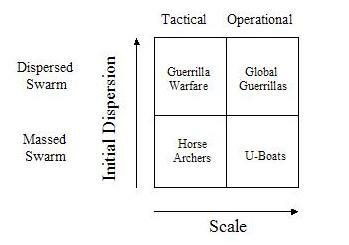 Unlike insurgencies of the past, the open source framework (a mechanism that allows autonomous groups to operate in concert) for Iraq's guerrillas allows them to conduct operational level swarming (see graphic, please forgive the 2x2 but this does the job). In contrast to tactical level swarming focused on overwhelming a specific target, operational swarming goes after a class of targets across large areas to achieve higher order effects. A chapter excerpt from my book "Brave New War" is up. It's time to rethink the narrative for this war. JOURNAL: Gated Communities for Baghdad? Classic counter-insurgency runs into problems when faced by a modern city. The connectivity that is necessary for a city's operation undermines any attempts to hold cleared districts. Recent developments indicate that the COIN team in Baghdad is starting to think the same way. As a result, we will see lots of attempts at ways to reduce this connectivity without destroying the economic basis for the city. The approach that the US military has opted for is an inversion of the gated community approach. It will wall off restive districts from the rest of the city rather than protect successful ones -- the first wall to go up will be a three mile, 12-ft high barrier around the Sunni Adhamiya district. However, since the barrier is based on subtraction (it reduces the connectivity for the restive district to the rest of the city), it will serve to lock-in failure since economic activity will likely halt in the affected area. Down with Maliki! Where is the security plan? We are not protected by this plan. Shouts from an angry Shiite mob as they threw stones at the US and Iraqi troops that arrived at the scene of one of the 5 car-bombings that killed 160 people in Baghdad on 18 April 2007. Further negative proof that the surge has failed to slow even Sunni insurgent activity or add legitimacy to the apparently hollow government. A beguiling false narrative currently circulating throughout the media, is that the US surge in Baghdad may work given time (or at worst keep violence in check at current levels). In reality, things in Iraq are about to get much worse over the next year and approach what could be called a second front. The main reason for this is that the Petraeus/Nagl/Kilucullen approach to counter-insurgency is antiquated/misguided and will, soon, radically increase the level of resistance rather than lessen it. So far, the bulk of the resistance to the US occupation of Iraq, has been from Sunni groups (from gangs to jihadis to ex-Baathists). These numerous groups operate within an open source framework which is both resistant to counter-insurgency/political resolution and extremely quick to learn/adapt. Further, the relative modernity of Iraq features vectors of cross-connection that undermine any and all attempts at clearing/holding territory (the core of the Petraeus plan). As a result, no progress will be made against the insurgency. In fact, there are strong signs that the open source insurgency has found ways to keep up its momentum. Mahdistic (Najaf and Basra). Target: the increasingly irrelevant Shiite establishment in Najaf and the Iraqi government. Sectarian militias (primarily in Sadr City) Target: Sunni groups and the US military. Regional militias. Specifically, the remnants of Sadr's militia and the Fadhila party (an off-shoot of Sadrist movement) in a contest for control of Basra and the Southern oil company. Systems disruption that targets the southern oil fields and export infrastructure -- this month's bombing of a pipeline from the Rumaila oil field is an early data point. This disruption will increasingly starve the Iraqi government of its only source of revenue and drive up global oil prices. IED attacks on US supply lines. The US supply routes from Kuwait will fall under increasing attack. This will create shortages of fuel/power and ancillary goods at the big US bases (really small cities completely supplied from the outside). Attacks on Shiite religious leadership that will fracture Shiite social bonds and potentially the already hollow government. BTW, if you want to understand where all of this is going longer term, please buy my book, "Brave New War." One of the most confusing aspect of modern insurgency for the "experts" * is that nearly every guerrilla group worth observing is advancing on the objective of state failure rather than state replacement. ** As in, why would Hezbollah want to rule Lebanon? Who would want that headache? It serves as a bulwark against pressure from external Western encroachment. Any action against the non-state group from the outside harms the fragile hollow government (particularly its legitimacy). Bomb the group, harm the state since virtual or defacto ownership of territory means that the group never really owns any infrastructure (it just rents it). The existence of the state provides a perpetual enemy against which to fight. Eternal warfare isn't a negative thing for groups founded on the proposition of struggle or competence in warfare. Often, meaning is only found in opposition. It eliminates any real requirement to actually provide social services. The state can be held responsible for any failure in this regard. The only true responsibility these groups retain is to their membership. Often the only external benefits (outside the group), these organizations provide are cessation of violence through imposition of codes of conduct/means of adjudication (from the PCC to the Sharia of the ISI). * I agree with John Boyd in the term "expert" is akin to "half-wit" since expertise in a rapidly evolving field of knowledge is only valid on the first day it is attained. After that, you become a dogmatist unless you are constantly engaged in the synthesis necessary for updating your ideas. ** This is also a great example of how an historical narrative can mislead. Experts, schooled in counter-insurgency, look to the narratives of Mao and Ho for guidance. Their method uses hierarchical and ideologically cohesive organizational forms to build a shadow state that moves from guerrilla warfare during to the early stages of the conflict to conventional warfare (which enables them to seize/control territory) in the final phases of the conflict. The empirical trend data of modern conflict suggests otherwise. The US is unable to clear and hold territory. Even the most secure areas are vulnerable to insurgent attacks. Systems that underly normal societal function, even those under heavy guard/control, can and will be disrupted well into the future -- which will prevent any meaningful recovery. Any and all political solutions, even if they do occur, will not have any resonance since the participants lack any meaningful legitimacy. The participants cannot survive even within the US security bubble. "Many of these ballads [narcocorridos, or drug trafficker's ballad] are in the classic Medieval style, and they are an anachronistic link between the earliest European poetic traditions and the world of crack cocaine and gangsta rap." Elija Wald. the state (to demonstrate its impotence through brazen announcements of intent). Here's an example. The popular Mexican singer, Valentin "The Golden Rooster" Elizalde wrote a paean to the Sinaloan cartel that villified the Zetas/Gulf Cartel. The song's video was posted on YouTube (featuring bodies of killed cartel members from news clips). The Gulf Cartel/Zetas sent a return message by killing Elizalde and his manager outside a concert, punctuated by a YouTube video of Elizalde's autopsy. Historically, information warfare was restricted to elites (government, media, parties, etc.). The onrush of Jihadi videos, political pro-war/anti-war blogs, and narcocorrido videos have categorically demonstrated that this state of affairs has changed. We now live in a world where infowarfare is accomplished by individual practitioners through an open source framework. Over time, the gap between those in the open source framework and the elites will widen in the favor of the former -- we have only scratched the surface of where this empowering technology can go. However, more recent slayings have shown a marked tendency to try to transcend the limits of revenge. The videos have begun depicting the killers as vigilantes, bringing justice to the streets by killing off members of their hated rival cartels, which are depicted as the enemies of the people. Martin Van Creveld's famous dictum (the strong that fight the weak become weak) of modern guerrilla conflict is being proven yet again in Mogadishu Somalia (accelerated by globalization). Three months ago, a conventional Ethiopian army swept the Islamic Courts from power through a series of lightning assaults. Western governments applauded. The guerrillas reconstituted within a month. This week, a beleaguered and confused Ethiopian army is now facing charges of war crimes (in the EU) for the indiscriminate bombardment of civilian neighborhoods. Around here, bikers mean trouble. After all, who rides motorcycles? That’s right: young guys with too much free time and too much energy. The bikers are headed past my hostel and towards the other end of the street, so I follow. At a roundabout they converge, yell at each other some then scatter again. I’m starting to get a feel for what’s happening. This is mechanized political violence. Both sides have armies of dudes on bikes itching to fight. Only the U.N. is keeping them apart. Last year, a former Timorese police officer, Major Alfredo Reinado, gathered a 600-strong army of disaffected policemen to challenge the government, which was carefully planning for a critical presidential election scheduled for April 9. In recent weeks, Reinado’s force has raided government facilities and stolen weapons. There are $2-a-day thugs, many of them recruited by the political parties from the city’s refugee camps, roaming the streets, looking for something, anything, to kill. "They had the same mentality I had: Get rich or die tryin'" Crew member Eugene Rhodes. Big gangs have a shadow of their former influence here, but they have been replaced by small, loosely organized bands of young men who commit strings of violent offenses before breaking up, or ending up behind bars. Their unpredictability has come to confound even veteran street cops and prosecutors who despite years of studying street-crime patterns are suddenly behind the times. "They are the least predictable; they're the toughest to break up because they can be so spontaneous," said Milwaukee County District Attorney John Chisholm, who led the county's gun-crimes prosecutions for six years and has considered a specialized prosecution team to go after crews. "They would really require the most resources to get rid of. . . .The damage just one crew like that can do is significant." The article also contains a lengthy description of the birth and death of a single crew. Worth the read. To James Fallows -- the author/journalist/editor, renaissance man, and big thinker -- for writing a brilliant forward to my first book, "Brave New War."